Search functionality is based upon Apache Lucene open source software, which uses index files to speed the process. When Process Commander is initially installed, only the rule index setting (for rule searches) is enabled. 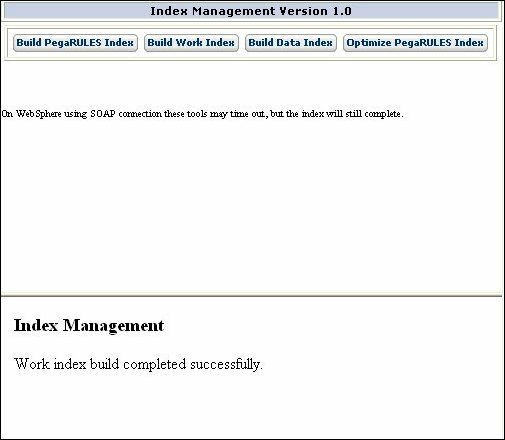 To begin rule indexing, in the System Managment Application open the node for the server, go to Administration > Index Management, and click Build PegaRULES Index. Data object indexing and work object indexing are disabled by default because they can require substantial server computing resources and may compromise performance in production or high-volume systems. If you choose to enable data and work object indexing, follow the procedure as described below. Update: In v6.1, use the System > Settings > Search landing page to control search operations. Note: By default the index files are created in a directory called PegaRULESIndex in the temporary directory you specified for Process Commander during installation. 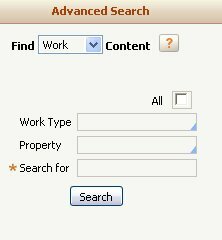 If you enable additional indexing, especially of work objects, over time the index files can become very large. In addition, if the contents of the temporary directory are deleted during upgrade or maintenance, you will need to regenerate the indexes. You can specify a different location for the index files during installation in the Rulebase Utilities (prdbutil.war) Setup procedures (Step 5), or in Process Commander by setting the Dynamic System Setting index/explicitindexdir. You must create the directory in your file system and be sure that your application server has read/write access. If you set an explicit index directory in a system that has been running with the default configuration, restart your server and use the System Management Application to regenerate the indexes. From the Rules by Type explorer tree in the Developer portal, select SysAdmin > Dynamic System Settings. Select and open the indexing instance you want to change ( Pega-RULES.indexing/dataenabled or Pega-RULES.indexing/workenabled ). Save the Dynamic System Settings form. Repeat steps 2 through 4 if you want to change the other setting. If your system consists of a single node, stop and restart the node to have the changes take effect. In a multinode cluster, the changed settings will take effect after the Index File host machine (as defined during installation) is restarted. You can build these indexes while a Process Commander server node is operating, but the processing may degrade system performance if the indexes are large. As a best practice, perform this task when the server is down (Process Commander is not available) or has a light workload. In the Developer portal, select Tools > System Management application. 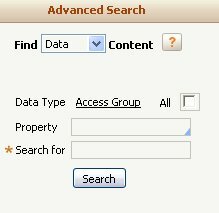 Select the node on which the index files are located and then choose the Administration > Index Management menu item. Note: When running in a multi-node mode, the initial index build is on the host node specified during the installation (the hostname node). Your index settings apply to all nodes in your system. Click either Build Work Index or Build Data Index. Each starts processing that may require several minutes to complete. When processing is complete, a success message appears. 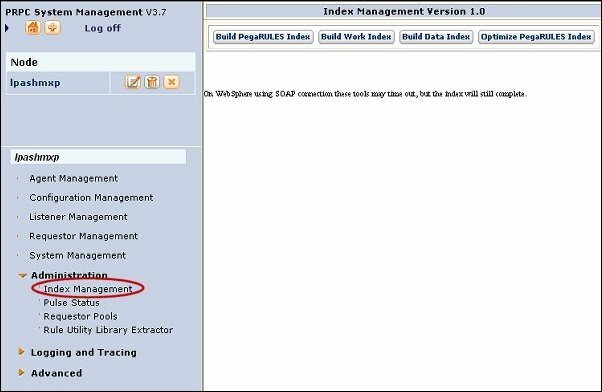 If you want to enable another index, wait until the first index build has completed and then click the other index button. To verify your updates, select Edit > Advanced Searchfrom the Developer portal. Depending upon the indexes you enabled, you can now choose the search type in the Find Content field as shown below. Click the help icon for information about the search fields.